Maybe I should just send this love letter straight to Al Ewing? Politics in comics! Would you rather have the possibly naive optimism of the U.S.Avengers or the crass “everyone is awful” humor of Captain America: Sam Wilson? Since I’ve rated the former as my favorite comic of the week and shoved the latter to the bottom of my satisfactory comics section, you can guess where I stand. I say it’s nobler and more useful to inspire empathy than to heap scorn, particularly when your object of ridicule is a strawman of your own invention. Comics are about punching bad guys first and foremost. Mission number two should be reminding us to be awesome, not encouraging us to be negative. This was a pretty light week for new Marvel Unlimited additions, with just 16 new books plus a lonely (and pretty skippable) Deadpool one-shot from the 90s. Check out the release calendar and then hit the jump for my ratings. Issues that restore your faith in comics and/or humanity. Remember how awesome Al Ewing’s New Avengers were? Meet his U.S.Avengers, somehow even awesomer! The roster has been tweaked and given a hyper-patriotic coat of paint, and the team tears through a Secret Empire revival like hot tea through ice cream. What will they make of the Golden Skull? Just when I thought the patriotic trappings were a gag, Sam Guthrie and Bobby da Costa talk about America in a way that takes my breath away. This book is about heroes who talk about humane and inclusive patriotism while blowing up flying terrorist volcanoes. I am in frigging love. The final arc of the series launches with incredible power. Marc Spector has found clarity at last, and with it, a mission: Khonshu must die. While he travels back into New Egypt, we get a peek at his boyhood and the arrival of his imaginary friends Steven and Jake … and Khonshu. Art, writing, and characterization are all at their very highest levels in this brilliant issue of a brilliant title. Marvel has always been ridiculous, but are we living in the days of peak absurdity? Rich likes Sam, the Champions not so much. Earth has forgotten him, but Knowhere remembers. So does bounty hunter Death’s Head. Uh-oh. This book offers beautiful art, terrific character interaction, and some of the best humor being written in a non-funnybook. “Rich meets the Champions” is a gag for the ages. It’s a hilarious yet fair take on a core complaint of certain Marvel superfans these days. This series started strong and now it’s getting stronger. Kate gets a much-needed reality check from LAPD Detective Rivera, then realizes that her first case involves something bigger than a solitary stalker. The local “TBC” group is looking cult-like and mind-controlling in a super-villainous way. We may be headed for a lesson about the evils of MRAs, but for now, the connections are implicit and the comic isn’t preachy. The under-detailed character art is the only part of this book I don’t absolutely love. Oh, and holy ☠☠☠☠, these covers by Julian Totino Tedesco. Total “Kiss Kiss Bang Bang” pulp novel joy. Comics that go significantly past “satisfying.” Despite evidence to the contrary, I do not automatically assign four stars to any comic featuring Nadia Pym. Bill and the Odinson bust loose, picking up Thori the Hel-Hound on their way to Ultimate Mjolnir. The Unseen has arrived with Proxima Midnight and the Black Swan, Thanos’s creatures. A little bit of irreverent humor and a plot-interrupting burst of “warrior madness” mar this otherwise epic story. I’m starting to suspect that my sense of humor doesn’t really gel with Jason Aaron’s. Nadia saves the day, her teammates, and baby Kang, and yet this Kang War storyline is somehow still not done. Argh. By my count, fully 70 percent of this team’s adventures over the past two volumes have been Kang-centric. That’s too much Kang. Still, an awesome role for the new Wasp and awesome painterly art by Mike Del Mundo elevate this into something a bit special. Somebody who reads this title in the future – perhaps without reading ANAD Avengers first – will likely enjoy it more than a contemporary reader suffering from Kang fatigue. Nadia’s solo series kicks off with a classic giant robot fight and some serious torch-passing courtesy of Ms. Marvel and Bobbi “Mockingbird” Morse. (That’s no accident; thinking of this title as an all-ages mix of Ms. Marvel and Chelsea Cain’s Mockingbird is very apt.) The new Baby Wasp makes it her mission to find and elevate the Marvel universe’s under-appreciated girl geniuses. It’s a promising start and a good mission, but the author seems too eager to pat himself on the back about his STEM-loving female lead. Solidly entertaining comics that aren’t a waste of time. Logan is back in the Wasteland dealing with Kang (sigh). Or is he on a space station fighting the Brood with Puck? Or neither? Reality is on the fritz. This new story arc has a lot of promise, but there’s not much awesome on the pages yet. The split plotlines twine together with some nice cross-cutting, but they’re moving awfully slowly. I hate adult Wasteland Danielle Cage playing Hapless Prairie Wife. Colorist Marcelo Maiolo is the under-praised hero who really brings Andrea Sorrentino’s art to life. The Punisher gives a history lesson on the Phantom Eagle and our heroes eventually catch up to the baddies. The good news is that both the history lesson and the Punisher’s voice are outstanding. The bad news is that the villains are terminally dull and we’ve got three more issues of their nonsense to chew through. This title remains entertaining but not memorable. The Champions are shot down and captured by Atlanteans for no good reason and thus have to escape. By the end, even the heroes admit it’s been a pointless adventure. Plot, pacing, and layout are all troubled here. 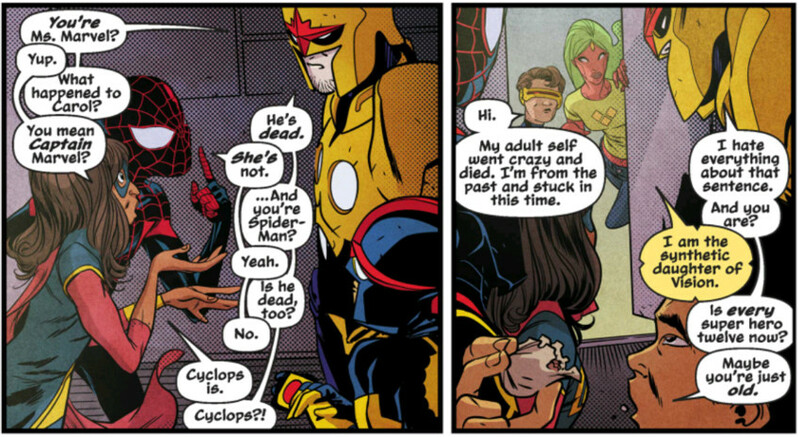 It’s the strong characterization and dialogue (and the epic bird-flip to IvX) that make this issue worth reading. Even so, it’s rather skippable if you’re pressed for time. The new Falcon and his pal Rage dump themselves into a political slapfight between a strawman Fox News pundit and strawman SJW students. Nick Spencer would like to be the Aaron Sorkin of Marvel comics, but this story is in no danger of being mistaken for a West Wing script. It’s not as bad as you might have gathered from de-contextualized panels posted on the internet, but it is by no means nuanced or constructive. It encourages you to keep mocking whomever you’re mocking. You can have a meaningful debate, but you need to supply your own insights – the comic doesn’t provide anything more than a catty intro. Something much darker and more interesting starts in the book’s final scene, though: The Americops arrest Rage for superheroing while black. 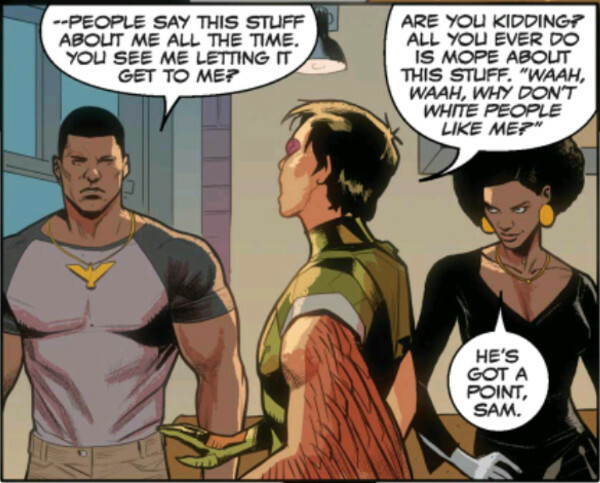 Sam went through this himself in the past (see issue #12), so his reaction should be good to read. Hey, look! 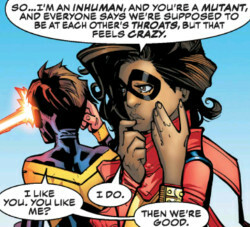 A de-contextualized panel posted on the internet! The comics of regret. I would be really upset if I paid cover price for these issues. But I didn’t! Yay, Marvel Unlimited! Elektra murders Medea, which solves the snake zombie problem in Chicago. Miguel’s girlfriend Tempest (remember her?) falls into the clutches of the mysterious Tyler Stone. This issue left me feeling very cold. Elektra’s lethal resolution rendered a good 80 percent of this issue pointless. I think I need a cheat sheet to understand the larger plot movements and character relationships. Stiff art and convoluted plotting that’s hostile to the casual reader make this a very difficult comic to like. Issue #1 barely gets us to plot point 1, the combination of Wade and Howard via teleporter accident. There’s nothing memorable about the separate stories leading up to this moment, and the final panels of the new DeadDuck having a high-volume vomit don’t bode well. The creative team surely recognizes the crassness of launching another “this is the next best thing to printing money” Deadpool book (they make a few jokes about it), but they do not do a lot to rise above it. Unless things pick up considerably in future installments, I would say this title deserves a pass. Got a good point? Bad point? Objection? Wanna argue comic politics? Use the comment box below and turn this lecture into a conversation!